The Moto Cross Racer drives forward, has working lights and a 6V motor. 6V rechargable battery included. Top Speed 3km/h. Maximum weight 30kgs. Dimensions: 120L x 56W x 83H cm. Recommended ages 3 years +…. This toy costs approximately £89.99 (for the latest and best prices make sure you check our retailer list for the Moto Cross Racer above). 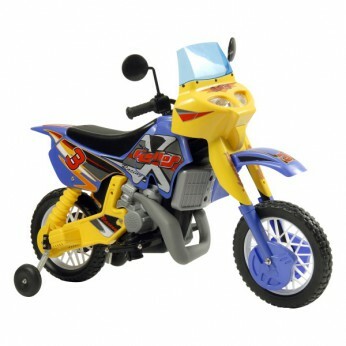 In our review of Moto Cross Racer we classed it as being suitable for ages 3 years, 4 years, 5 years but recommend you check the manufacturer specific advice before purchasing.